MYRTLE BEACH, S.C. - All nine batters tallied hits for the Frederick Keys (4-7), who powered their way to a 9-3 victory over the Myrtle Beach Pelicans (2-10) on Monday night at TicketReturn.com Field. Jake Ring collected a pair of doubles, two walks, and scored four runs while Mason McCoy continued his scorching start, going 3-for-5 with two runs, a double, a home run, and four RBIs. McCoy is hitting .457 (21-for-46) with four doubles, a home run and 13 RBIs during his 9-game hitting streak. The Pelicans jumped on top 2-0 in the first inning thanks to a two-run home run from Miguel Amaya, but the lead did not last long. 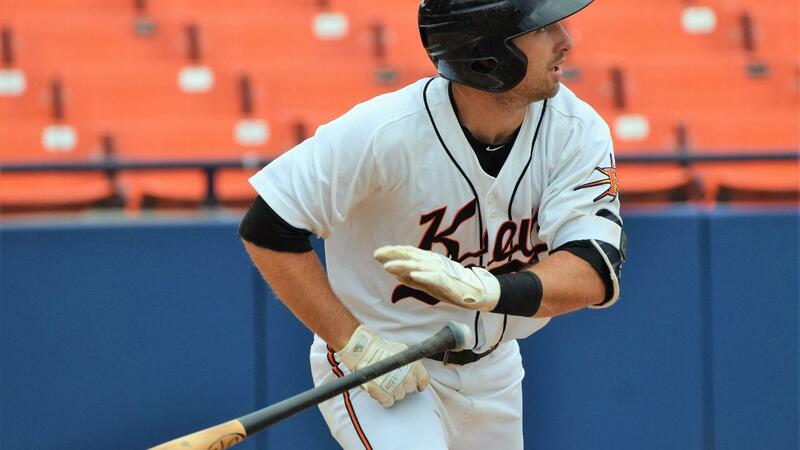 With the bases loaded in the third inning, J.C. Escarra singled in two runs to tie the game, and Trevor Craport gave the Keys a 3-2 lead with a sacrifice fly. Back-to-back two-out doubles from Ring and McCoy pushed the lead to 4-2 in the fourth and Zach Jarrett's solo-shot in the fifth made it 5-2. The Keys started the sixth inning with a Yeltsin Gudino base hit and another double from Ring. McCoy's groundout scored Gudino while a throwing error scored Ring to make it 7-2 Keys. Kevonte Mitchell got one back for the Pelicans in bottom half of the inning on a solo-home run. In the eighth inning, McCoy demolished the first pitch he saw for a two-run home run to cap off the 9-3 win. Keys starter Cody Sedlock (1-0) pitched well after a rough first inning, where he gave up four hits including the two-run home run. He allowed just two more hits and two walks while striking out three over five innings of work. Scott Burke allowed a home run to the first batter he faced but only gave up a walk in two innings following. Cameron Ming completed the final two frames and did not allow a hit or a run while walking two and striking out three. Luis Lugo (0-1) allowed five runs on seven hits over five innings. The Keys and Pelicans square off on Tuesday night with first pitch scheduled for 7:05p.m. RHP Brenan Hanifee (0-1, 8.00 ERA) takes the mound for the Keys. Pregame coverage begins at 6:45 p.m. on frederickkeys.com and the TuneIn radio app. For a complete look at the 2019 Keys promotional schedule fans can visit frederickkeys.com.